My kids look at me like I've just taken a drag on a cigarette when I touch my phone. The sigh, She's on her phone again. Which means she's not paying attention to us. And they’re right, I'm not. Yet it feels so pressing, just give me a minute. But the minutes click by, the kids walk off, and another morning passes where I didn’t consider the cost of having this screen in my hand. Here is a book that you and I need badly. (I struggled to read it at times because it made me hyper aware of how much more quickly I could get through it if I wasn’t constantly touching my phone. 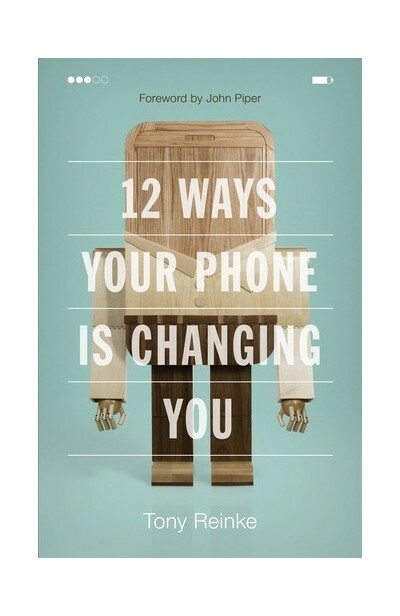 According to the latest IDC Research 79% of adult smartphone users have their phones with them for 22 hours a day.) All of us know there are significant changes that have taken place for those of us who have our phones in near constant reach - but it’s hard to untangle the good from the bad and the inherent qualities of the technology and the user. “The phone’s not the problem,” my husband says, “It’s the people who use it.” And he’s right in one sense. Reinke finishes his book by showing John Piper, eyes glistening with his laptop, his iPad, and his iPhone all sitting on the table in front of him saying, “I could almost come to tears over how precious they are to me.” The books he’s tapped out on those devices, the articles he’s read, the sermons he’s been able to share, the interviews he’s given. And yet at the same time the open gate to temptation that is there for anyone who lacks some self control. Or is it more than self-control that’s missing? Do we understand the tool that’s in our hands? I wonder if there is something in our not fully grasping what exactly the technology is doing to us that hinders our ability to use appropriate boundaries when we use our smartphones. And I wonder if knowing that could create a whole different approach to our phones. Reinke certainly thinks so. We also have to acknowledge that this new tool is the swiss army knife of digital technology, growing new flick knives every day. As I’ve contemplated what Reinke has said about the problem of convergence on our phones and the corrosiveness of distraction I’ve come to the conclusion that I don’t have to master my phone - as it will surely continue to morph in its capabilities - but I can work at making my first things first things: the people right in front of me are more important than the demands of my phone. I don’t have to let my phone rule my life. It’s a tool. I’m a person. God rules my life. How Does My Use Of Technology Affect Other People? Other people (little people and big people) want to be seen. We want to be fully known. Reinke spends a whole chapter on our craving for approval and the ways this impacts our phone use. Only our creator can satisfy that longing. But still, as image bearers and servants of the King we must show some of the wild generosity of the King by being fully present with other people when we're with them. Having your phone out and in your hand shows that your attention is divided and can be held captive by someone outside the space you're both inhabiting at any moment. This creates anxiety. My children eye me with disapproval when I ignore them with my phone and they have every right to. It’s rude. And I need to give up my constant phone check ins to love these little people more fully. What Are You Like With This Tool? I have some great times with my phone and I bet you do too: taking photos; writing notes; making beautiful images; finding special articles and YouTube clips; texting friends back and forth at rapid speed; overusing emojis with my husband; enjoying a chat with my Bible study ladies in WhatsApp; playing music; interacting with friends on Facebook, looking at my running stats, reading the Bible; and often being prompted to pray. And I know your list will look ‘uniquely you’ because the way we use our phones is highly tailored. But Reinke writes, “What is the price of all this digital magic?” (p. 17) The days when I use my phone the least are my best days. I write that down after a Saturday where I forget to take my phone out. I'm not being pulled in a thousand different directions. I'm more focussed. I enjoy the moment. I feel less anxious. All the less surprising then when here is what it looks like when my phone turns into a vampire: Lost down the rabbit hole of Facebook. I click off to unfamiliar places, scrolling through people's lives I don't know and probably will never meet. Judging. Looking up Celebrity Gossip. Shopping. Lusting after things I don't really need or can't afford. I hear the Email sound, subtly different to the text ding. I anxiously re-read my reply checking for ways it could be misinterpreted. I feel like I’m being pulled to pieces, and then the phone (That's right, it's a phone!) actually rings and I stare at it helplessly. All too overwhelmed I silence it. I spend the last bits of me here, scrolling, instead of helping to clean the kitchen or read the kids a story. I’m bored and I’m exhausted but all I have the imagination for is just this nothingness. I let it take the last drops. Does Your Smartphone Help You Run? If the Christian life is all about knowing Jesus and throwing off everything that hinders in order to run the race (Hebrews 12:1) - does my smartphone help me do that or does it hinder me? My answer after reading Reinke is “yes and no”. But yours might be different. And that’s why this book is so helpful. Your answer might be as radical as getting rid of your phone. I would certainly like to try having a digital sabbath and two two week digital breaks a year - all ideas from the book. To make radical changes is going to require us to face up to our smartphone habits and examine them in the light of God’s word. This book helpfully explained why I'm doing what I'm doing but it will take prayer and self control to create new more helpful habits. Next week in Part 2 I’ll unpack more about ways to limit unhelpful smartphone use as well as explore the helpful parts of the internet Christians do and should inhabit. We’ll also take a look at the ways our phones are damaging our literacy and what that means for our great faith task of reading the Bible. Meet our contributor Katie is a lover of books, baking and beaches. She leads a Bible Study at her local Anglican church in the inner west community of Sydney. She also teaches the Bible at two local High schools and is enjoying getting to know her students better and being stretched by their questions. Use the code EQUIPmission when you buy book and Reformers Bookshop will give 12% of your sale to support EQUIP's worker amongst Muslim women.